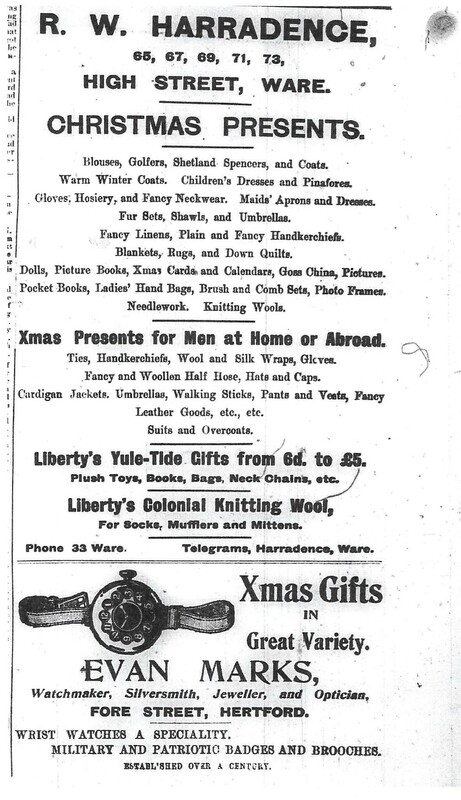 In spite of the war, the December 1917 editions of the Hertfordshire Mercury carried many advertisements for Christmas fare and ideas for presents. R W Harradence of High Street, Ware, for example, listed some enduring items such as gloves, handbags, dolls and picture books but it is doubtful if many shoppers in Ware today are looking for maids’ aprons and dresses. 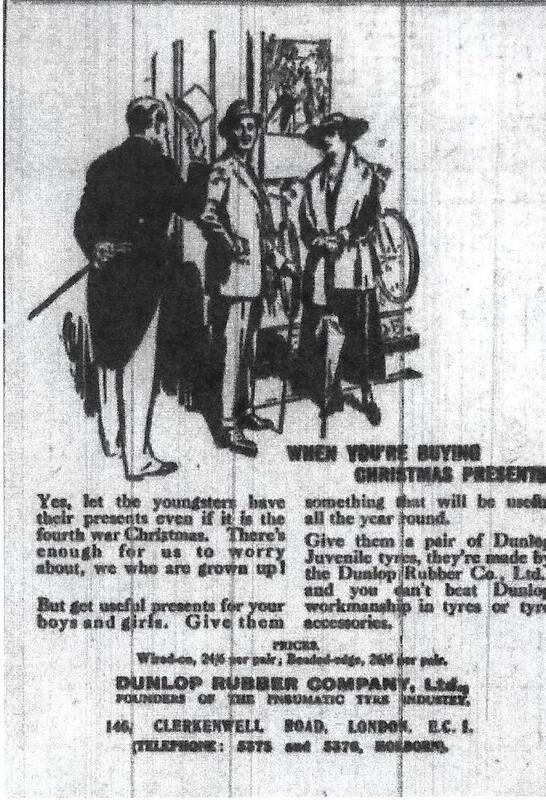 In Harpenden, Anscombe and Sons also included aprons in their list of potential presents along with pinafores, work baskets, down quilts and fancy linens. Botsford and Vale in the Market Place in Hertford encouraged customers to give useful presents with cutlery, razors and lamps as some of their suggestions. 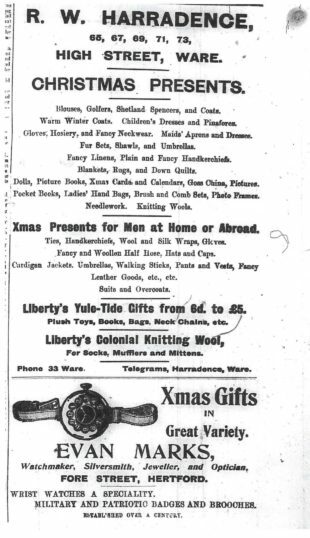 Christmas crackers were available but although Bates Brothers of Fore Street, Hertford were able to boast of a “large variety”, Government restrictions meant that they were unable to issue their usual detailed list. There was a variety of festive fare. 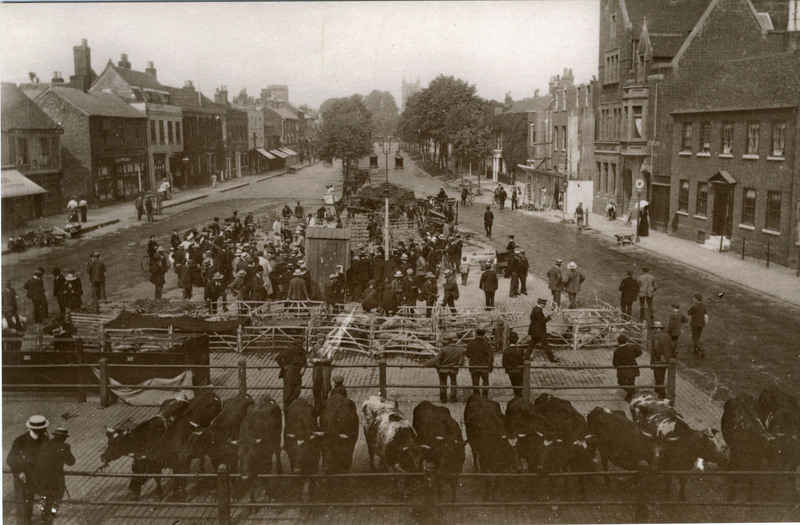 Barnet’s Christmas fat stock sale was planned for12 December advertising “100 grand fat oxen and heifers, 32 fat shorthorn cows, 350 prime fat sheep and 35 calves “. The St Albans sale offered 52 grand fat oxen, 406 sheep and lambs and 34 pigs and sows. 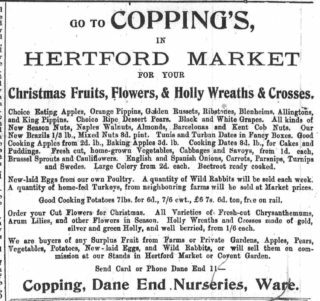 Hoddesdon Market had its Christmas sale on 19 December 1917 with poultry, geese, ducks and turkeys available. 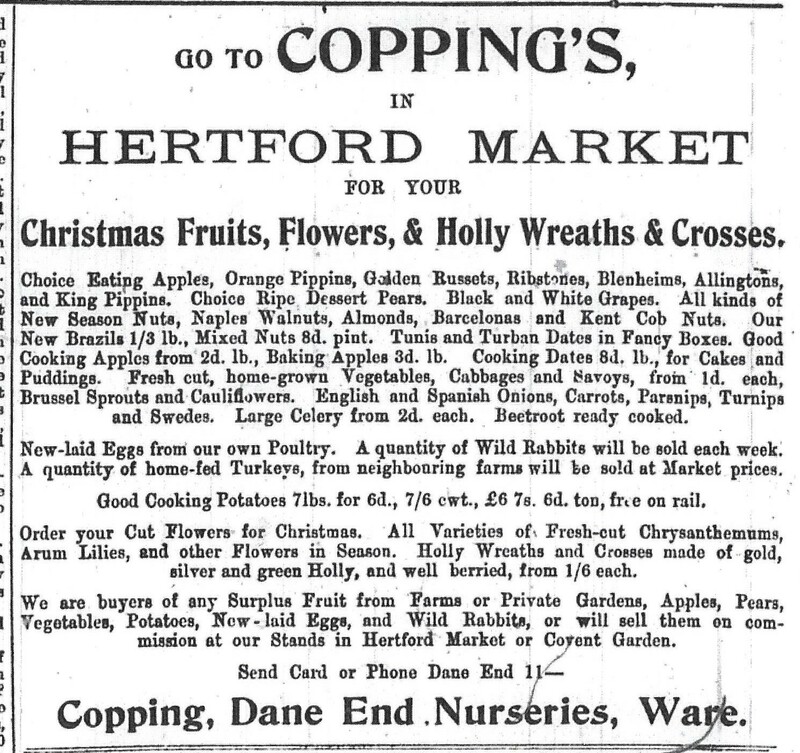 Turkeys were also stocked by Copping’s in Hertford plus wild rabbits and eggs. Fruit and vegetables included cooking apples from 2d. a pound, cabbages from 1d. and large celery from 2d. each. For decoration, chrysanthemums and lilies were available plus holly wreaths from 1/6d. each. Money to provide for all these good things may have been provided by membership of savings clubs during the year. At Kimpton, the Annual Slate Club shared £87. 16s. 0d. amongst its 63 members giving each £1. 7s. 0d. to spend. There were also acts of charity. The Hertfordshire Mercury reported that in Braughing “the ancient custom [of Goodening] was observed on St Thomas’s Day when seven widows perambulated the village in quest of alms to provide good cheer. They were well received by the residents and the money collected was equally divided amongst all the indigent widows of the parish by the Rev. W. W. English. A century ago the widows who went Goodening always donned red cloaks”. As it does tend to dry out, store in greaseproof paper. This page was added on 22/12/2017.